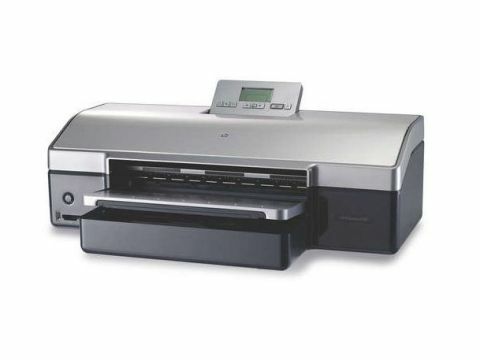 HP's Photosmart 8750 is a medium-format printer for semi-professionals and small businesses. It can theoretically print up to A3 , though because it uses horizontal feed trays, it still has a comparatively large footprint, even when closed. When printing, it doesn't take up as much room as some others, though. What we've said about medium-format printers not having many bells and whistles doesn't apply to the Photosmart 8750. A neat little flip-up panel at the back of the printer's top cover swivels open to reveal a small, blue-tinted LCD display and a row of eight buttons. These are used with a cluster of five memory card slots at the bottom left of the front panel to print images directly from most types of card - there's a PictBridge socket, too. Much of the control, though, comes from the HP driver, which works for most things, except that it appears to have no setting for a paper size of A3 (330x583mm). The manual confirms A3 should be available, but the largest we could print was borderless A3. Print quality is clear and detailed for both photos and plain paper prints of text and graphics. As supplied, the printer uses nine different, fade-resistant Vivera inks from three, tri-colour cartridges. Various other combinations can be used so, for example, you can replace the tri-grey cartridge with a single black one if you're going to be printing a lot of text. A caddie for a spare cartridge is even supplied, tucked under the printer's cover. Despite this three-cartridge solution, print costs are low, with a 5% black page costing 1.62p and the equivalent of a 20% cover page coming in at just over 4p. Print times are long, however, and this printer is not as nippy as Canon's PIXMA iX5000.